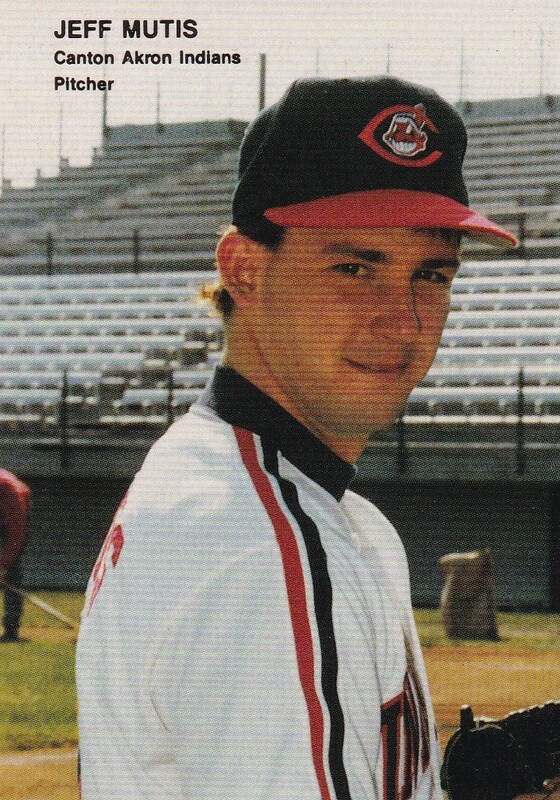 Coming off his first major league season, one where he lost all three starts while giving up 16 runs, Jeff Mutis was back with Cleveland in 1992. In his first outing, Mutis went four innings of relief, giving up just one earned run. "I'm glad they're giving me another shot," Mutis told The Associated Press. "... (Indians pitching coach) Rick Adair got me to stay behind the ball and it helped my velocity." Mutis' later outings, though, weren't as good. He only got two more that year, giving up seven earned in one 5.1-inning outing and four earned in a 2-inning outing. Mutis went on to pitch parts of two more seasons in the majors, pitching better, but still posting ERAs over five his final two years. Mutis' professional career began in 1988, taken by the Indians in the first round of the draft, out of Lafayette College. The Allentown, Pa., native starred locally, first getting drafted by the Indians in 1985, out of Allentown Central Catholic High. Playing the summer of 1984 with the Pennsylvania Legion's Mountainville team, Mutis punctured his foot by stepping on a rake, then, that night, struck out 10 and gave up only two hits in a playoff win, The Allentown Sunday Call-Chronicle wrote. By 1988, Mutis was with the Indians as their first-round pick, 27th taken overall. Mutis played that first year between rookie league Burlington and single-A Kinston. He returned to Kinston in 1989, making AA Canton in 1990. At Canton-Akron, Mutis went 11-10, with a 3.16 ERA. In 1991, back at Canton, Mutis went 11-5, with a sterling 1.80 ERA. It was in June of 1991 that Mutis made the jump from AA Canton to major-league Cleveland. He ended up getting those three starts, 12.1 innings, giving up those 16 earned runs. He picked up his second of three losses June 21 at Toronto. "On a couple of the hitters I felt like I was aiming the ball," Mutis told The AP after that outing, "and that's not the way to throw strikes." After that 1992 season, where Mutis picked up another two losses with Cleveland, spending the rest of the year at AAA Colorado Springs, Mutis saw a lengthier stay in the majors. Mutis got into 17 games for the Indians in 1993, 13 of them starts. He also got his first three big league wins. His ERA, though, was still 5.78. For 1994, Mutis arrived with the Marlins, taken off waivers from the Indians during the off season. With the Marlins, Mutis turned to relief work, something he had hardly done in his professional career to that point, The South Florida Sun-Sentinel noted. In June, Mutis picked up his fourth career win, coming into a game against the Phillies in relief, going 1.2 innings. Florida manager Rene Lachemann told The Allentown Morning Call it was the best he'd seen Mutis pitch. "I'm getting more work and I'm getting in a groove," Mutis told The Morning Call. In 35 outings and 38.1 innings for the Marlins that year, Mutis posted a 5.40 ERA. His final game came July 31. It turned out to be his final game in the majors. Mutis, though, played three more seasons. He played 1995 with the Marlins at AAA Charlotte, then 1996 with the Cardinals at AAA Louisville. In 1997, his final season, Mutis returned home, starting two games with the independent Allentown Ambassadors, ending his career.